The Panama Canal - which connects the Pacific and Atlantic oceans - has reopened after heavy rains forced traffic to be temporarily closed. Rains had pushed water levels to historic highs on Wednesday, potentially endangering shipping. However, the canal authority was able to let ships pass through again on Thursday morning. It was the first time the canal has had to close since the US invasion of Panama in 1989. About 14,000 ships pass through the Panama Canal each year, representing about 5% of world trade. The passage of ships through sections of the waterway has been suspended at times in recent years because of accidents, but not operations along its entire length. Much of Central America, as well as Colombia and Venezuela in South America, has been experiencing its heaviest May-December rainy season in decades. 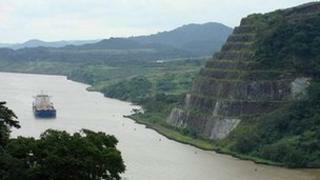 Unlike the Suez Canal, the Panama Canal is not at sea level. Instead, ships are raised and lowered by massive locks at either end, and pass through a freshwater channel fed by rivers that run off the surrounding forest-covered hills.